FOND MEMORIES . . . Former Derry City manager Stephen Kenny applauds the City fans after the club's FAI Carlsberg Senior Challenge Cup Final win over St Pat's at Lansdowne Road, Dublin in 2006. STEPHEN KENNY is worried Dundalk’s famous UEFA Europa League campaign will hamper their preparations for Sunday’s FAI Cup semi-final clash against his former club, Derry City, at Oriel Park. It’s a quick turnaround and Kenny is prepared to be pushed all the way in the last-four tie against the Brandywell outfit - a team he has enjoyed plenty of cup success with in the past. Kenny is determined to reach back-to-back FAI Cup Finals but he insists his priority remains defending Dundalk’s Airtricity Premier League title. And while they look a decent bet to complete consecutive domestic ‘doubles’, as they are presently four points ahead of second placed Cork City and go into Sunday’s cup semi-final as 1/2 favourites to progress, Kenny has warned they could yet emerge empty-handed at the end of their campaign. “The league is our priority,” he insisted. “We have a real tough programme in the league. But we’ve got good players at the club. We’ve had great experiences winning the FAI Cup last year with 25,000 people at the Aviva. “But it will be a tough game on Sunday, there’s no doubt about that. “We could win nothing,” he continued. “We’ve got to prove ourselves every week - that’s the challenge for us. We’ve got to keep it going. Cork are going well and will push us all the way and Derry will push us in the cup semi. 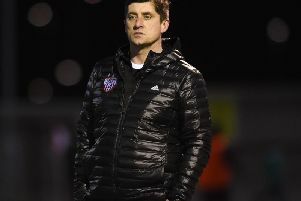 Kenny has enjoyed a real love affair with the FAI Cup since leading Longford Town to the showpiece during his three-year tenure at the Midlands club. He lost in two FAI Cup Finals (the other with Bohemians in 2001) before clinching the trophy with the Candystripes in 2006 in that dramatic 4-3 win over St Patrick’s Athletic at the old Landsdowne Road. And so he understands what the competition means to five-times winners Derry City and the Brandywell Faithful. Mention of that 2006 Cup success with Derry brings back fond memories of a sensational season in the history of the Lone Moor Road club for Kenny who guided the them through a remarkable UEFA Cup journey. And Kenny, who has led Dundalk to the cusp of the Champions League group stages and into the UEFA Europa League this year, says the Lilywhites’ historic European run has had him reminiscing about those memorable nights against Gothenburg, Gretna and European giants PSG. It was an unforgettable season for Kenny but one of his abiding memories of that European run was at the Irish Embassy in Paris where Derry City were granted a reception by the Parisian dignitaries. “Derry is an amazing club, a great club,” beamed Kenny. “My two sons are still playing their football in Derry. One is at Foyle Harps and the other at Tristar. “Derry is an amazing club. A third party pointed out to me the other day about how this European run we’re on reminded him of the run in 2006 with Derry which was amazing. “I just remember how we had a full reception in the Irish Embassy in Paris and it was pointed out to me that Kevin McHugh was wearing a white pair of runners with his suit. There he was, wearing a striking pair of white runners with a suit,” he laughed. “I was nonplussed at the time - I remember I was none too pleased. But we had a good laugh at that when we were recalling that run in Europe we had at Derry. “I remember the queues at the airports as we were coming back from those trips, the TV camera crews from BBC N. Ireland and UTV really got behind the whole thing. “The BBC showed the game live and I remember the crowds greeting us at the airports at all hours of the night. “It really captured the imagination.